Disney’s Beauty and the Beast is the classic story of Belle, a young woman in a provincial town, and the Beast, a young prince trapped in a Beast body by a spell placed by an enchantress. If the Beast can learn to love and be loved, the curse will end and he will be transformed to his former self. But time is running out. If the Beast does not learn his lesson soon, he and his household will be doomed for all eternity. I have not seen the Beauty and the Beast cartoon or know the detailed storyline of the Beauty and the Beast tale and yet I find the Beauty and the Beast musical very easy to follow – I have heard a few Beauty and the Beast songs here and there over the past few years so the songs sung were very familiar to me. Generally, I sometimes struggled to hear the singing of musical performances especially if the articulation is not clear (or muffled) and the words used are unfamiliar e.g. old words with strange accents (like in CATS the Musical). 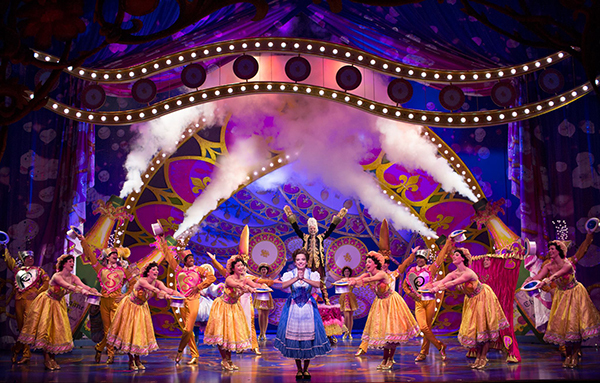 However this is not the case with the Beauty and the Beast musical showing now in Singapore – the singing in general was very clear and strong especially the female lead for Belle – Hilary Maiberger. The song lyrics were simple to follow so I think this musical is suitable for all ages e.g. children (especially if they enjoyed the storybook version) – even me as an adult loved this musical! 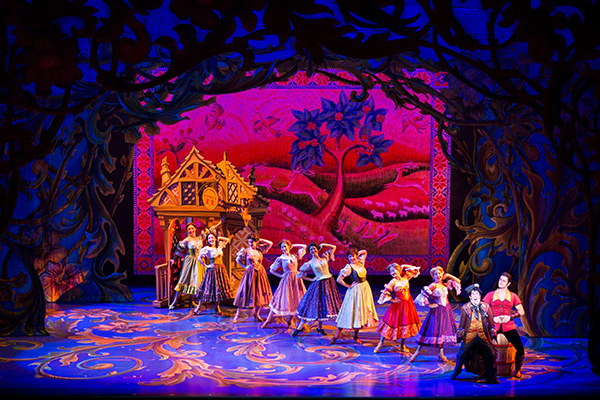 I have seen snippets of the Beauty and the Beast cartoon where there are dancing candles, clocks, teapots and many other household items so I was very curious about how they will design the costumes and characters in real-life for a musical. I was not disappointed at the creativity in how they designed the characters – see the picture below and see if you can identify the Candle, Closet, Clock, Duster, Teapot and Cup from the Beauty and the Beast cartoon! My absolute favorite scene is the Be Our Guest scene – it is eight minutes long and feature lots of dancing, costume changes, singing – truly spectacular – you just have to see it for yourself. Besides the dance sequence, the cast also makes use of props like metallic beer mugs to create rhythmic live sounds by clinking their mugs – almost like a rendition of Anna Hendricks “Cups” but on a much larger scale! This is separate from the Be Our Guest scene. People typically draw comparisons between The Lion King and Beauty and the Beast musicals because these are classic Disney stories. I say both stage sets and dance choreography are excellent – the “genres” are slightly different i.e. animals vs. humans so I don’t think it is necessary to compare – simply put if both were showing, I would catch both! That’s how good they both are! 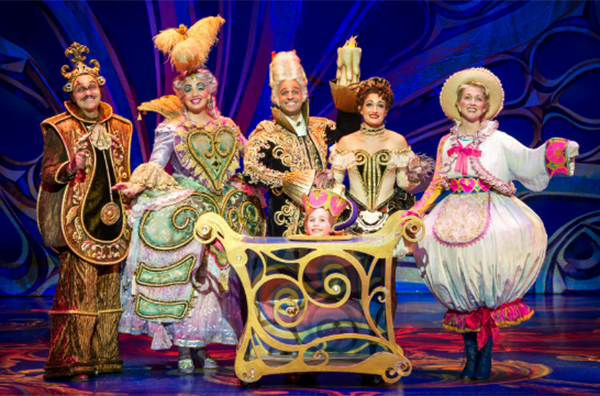 I think what makes the Beauty and the Beast so popular is the message and the story which transcends all ages.It is a musical that will make you laugh a lot, cry a bit and go through all different emotions in the short 2 hours+. This is why I strongly recommend the Beauty and the Beast as a must watch show here in Singapore. It is also interesting that love has blossomed between the Beauty (played by Hilary) and the Beast (played by Darick) in real life. 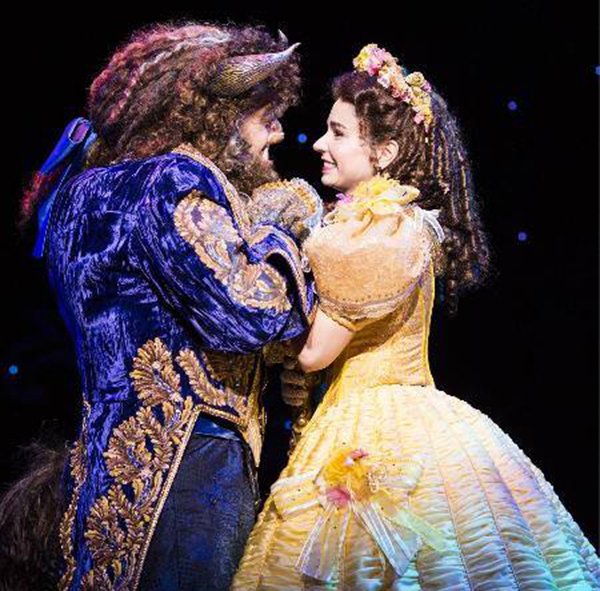 They had became a couple off stage after playing Beauty and the Beast as lovers on stage for three years! – Sundays at 1:00pm and 5.00pm. 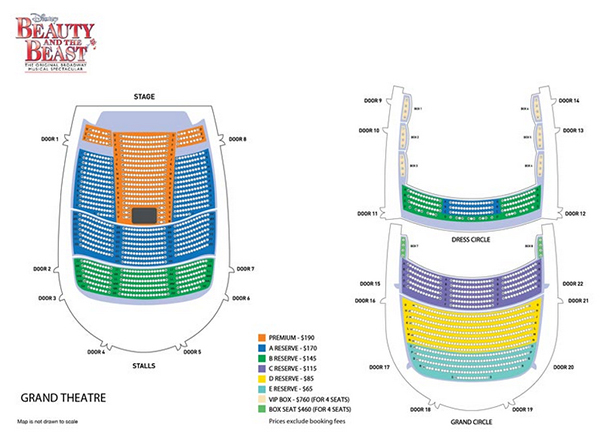 Buy your Beauty and the Beast tickets online with ShowBizAsia/SISTIC.